Energen's energetic player from Cebu, Asilum, scored 10 points in this game as he showed to the whole crowd that Cebu can also produce great amateur players, but in the end his effort was put into waste as the San Beda Red Cubs rolled over them. The final score was 70-79 in favor of the Red Cubs. The San Beda Red Cubs have now won back to back championship titles in FilOil Flying V. But their win didn't come on a silver platter because Coach Olsen Racela made sure right from the get go that his Energen team will do everything they can just to prevent the Red Cubs from winning in this year's championship game. The Red Cubs' hot shot Daryl Nazareno scored 14 points while their new dominant and versatile big man Arvin Dave Tolentino, the one who succeeded La Salle's Ponso Gotladera, had a double-double game as he netted 25 points and 20 rebounds. All I can say about this kid is that he's a hard working young man who has a nice looking stroke from the outside and he's also a good free throw shooter. Just to remind all of you guys, he's also a player of the Energen Pilipinas Under 16 (U16) but he chose to play for San Beda in the championship game because he wants to give coach Britt Reroma a back-to-back FilOil Flying V championship. He was just unstoppable in this game as he tried to fulfill his promise to coach Reroma. The harsh truth in this game was, Arvin Dave Tolentino was just too much for the smaller big men of Energen Under-16. He was also one of the reasons why the Red Cubs maintained a comfortable lead from the first quarter up to the last 5 minutes of the ball game. The FilOil 2011 Juniors' MVP Francis Abarcar played like a magician in this game as he pulled out several tricks from his hat just to score 10 crucial points in this game for the Red Cubs. His points came when his team needed it the most because their opponent was threatening to make a run for their money. With Abarcar's on court brilliance he was named as the Juniors' MVP of FilOil 2011. Energen's zone defense helped trim SBC's lead down to 3 points in the last 8 minutes of the 4th quarter. Energen's Jayjay Alejandro showed some great slashing skills and excellent three point shooting as he dazzled away the crowd with his 23 points. His efforts enabled Energen a chance to make a come back. But in the last 1 minute and 20 seconds mark of the 4th quarter Kyles Lao, a young athlete from Xavier School, had a chance to make the lead of the Red Cubs down to 4 points but he was blocked on his way to the hoop by one of San Beda's big man. I think he was blocked by the very tall Gideon Babilonia. Energen threatened SBC but in the end they fell short and they succumb to defeat against the older Red Cubs. The best player of this finals game was Arvin Tolentino. He had 25 points and 22 rebounds. He was the one who sealed the deal for the Red Cubs when he made 4 straight points in the last 56 seconds of the ball game. In the awarding ceremonies, Energen Under 16 received 50,000 pesos and they got the 1st runner-up trophy. 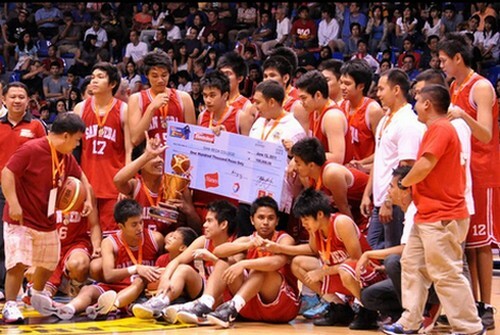 San Beda Red Cubs on the other hand won 100,000 pesos, the championship trophy and other valuable freebies. They've been undefeated in the eliminations of FilOil 2011 and coming into this game they are the favorite to win another title. They did win it. Thank you to all those who believed in them.